Signet rings for women are staple pieces of jewelry that every woman should own. This fall, signet rings for women are one of our favorite accessory trends and these gorgeous rings are everywhere. This does not come as much of a surprise because classic signet rings are simple, stunning, and timeless. Perhaps you were handed down a signet ring from a grandmother or another family member. If not, deBebians offers an exclusive and elegant collection of signet rings so that you can purchase your own and then pass it down to future appreciators of style and fashion. 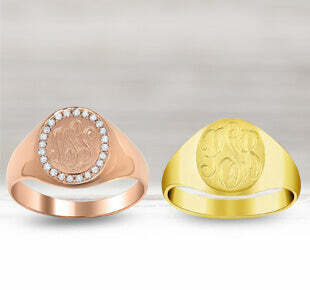 Signet rings made from yellow gold are traditionally the more popular choice for both women and women. The warm, buttery color of the gold perfectly complements the fall color scheme. However, white gold rings are also widely popular and may be a better choice for you, depending on your precious metal color preference. Signet rings for women are not just a fleeting style trend of today. These rings have been popular for decades. Purchasing a classic piece of jewelry such as this not only showcases your bold sense of style now, it is also an investment piece that you will be able to pass down to future generations, which will surely admire your sense of style.